To tow larger loads, pickup trucks will generally require a 5th wheel hitch and dual rear wheels. Gooseneck hitch arrangements look similar to 5th wheel hitches but connect in a different way; they are capable of towing the same weights, but depend on how your pickup is equipped and rated for those loads. Class I and II receiver hitches usually feature an opening of 1.25 inches. Class III and IV receiver hitches are generally equipped with 2-inch openings; some receiver-type hitches designed for heavy-duty use incorporate 2.5-inch openings. 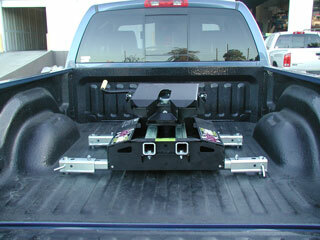 Installing a custom fit rear mount hitch can provide solid towing power for lighter loads. Heavy-duty trailer hitches are usually secured to the frame of the pickup for optimal safety and control over towed loads. Light-duty Class I and II hitches can sometimes be attached to the rear bumper to allow mounting of bike racks and towing of motorcycles and small trailers. Observing the weight limits for both bumper-mounted and frame-mounted tow hitches is essential to maintain safety on the road. Hitch locks are an inexpensive way to provide added safety during the towing process. These devices augment the existing pins and clips or ball mounts that typically connect the load to your pickup and can be a valuable investment in securing trailers on the road. Hitch covers are available in a wide range of colors, metallic finishes, and sizes to keep trailer hitches clean and to enhance the appearance of your pickup. We offer a full line of ball mounts, trailer hitches, and other Houston truck accessories to address all of your towing requirements. By customizing your pickup or SUV with our top-quality equipment packages, you can manage your work and personal towing needs more quickly and safely.